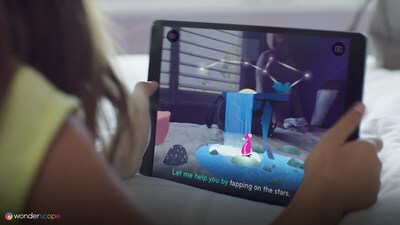 LOS ANGELES, Nov. 14, 2018 /PRNewswire/ -- Building on their commitment to expand the potential of storytelling through technology, Within today announced the release of Wonderscope, a new children's iOS app that uses the power of augmented reality to transform ordinary spaces into extraordinary stories. The free app, which marks Within's first AR offering, creates narrative-driven experiences that change the way kids engage with mobile devices by encouraging movement, reading aloud and interactive play. Using Wonderscope, kids don’t look into their devices, they look through them, combining the real world with one of make-believe. Photo credit: "A Brief History of Stunts by Astounding People," courtesy of Wonderscope from Within. Featuring stories that respond to a child’s movement and voice—including lines of dialogue that are highlighted as a child reads them aloud—Wonderscope showcases AR’s unique potential to elevate early childhood learning. Photo credit: "Little Red the Inventor," courtesy of Wonderscope from Within. Wonderscope creates narrative-driven experiences that change the way kids engage with mobile devices by encouraging movement, reading aloud and interactive play. Wonderscope uses "spatial-storytelling" to transform an iPhone or iPad from a screen to a magical lens. Using Wonderscope, kids don't look into their devices, they look through them, combining the real world with one of make-believe. "As a parent, I'm excited to release an app that builds confidence through reading," added Within's Executive Producer of Original Content, Samantha Storr. 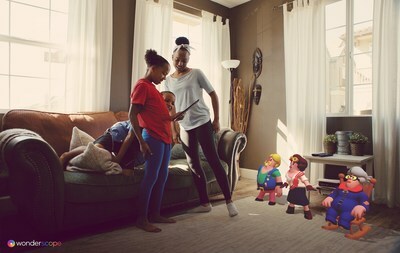 "We're utilizing augmented reality to let kids interact with aspirational characters, while actively playing and talking. Our stories tap into children's natural inclination to learn by doing, and they get the added joy of helping characters along unique journeys." "Wonderscope allows kids to engage on a deeper level and feel valued as they play an active character in the story," added Within's COO, Colin Decker. "We are only beginning to explore the new ways that technology can be used to support growth, development and confidence in young audiences." In A Brief History of Stunts by Astounding People children take part in three of history's most impossible stunts and meet the real people that made them happen: Betty Bromage, an 88-year old grandmother that stood on the wings of an airborne bi-plane; Helen Gibson, Hollywood's first stuntwoman; and Charles Blondin, the first person to tightrope walk across Niagara Falls. In Little Red the Inventor, kids pair up with Red, a modern-day Little Red Riding Hood who has added "inventor" to her resume. Together they solve tricky situations to evade the Big Bad Wolf, using their voices to stand up for what's right, and their smarts to become heroes in this new take on a classic fairy tale. Wonderscope is a free app that does not require user registration or a credit card. It comes with A Brief History of Stunts by Astounding People free of charge and users can purchase further titles, including Little Red the Inventor, for $4.99. Additional titles will begin rolling out in December. To achieve their vision of spatial-storytelling, Within created Storymaker, a development tool that allows storytellers to work without getting stuck re-creating core technology. Storymaker helps reduce cost while ensuring top-notch interaction, voice integration, and much more. Within will continue working with some of the best artists, animators and storytellers to advance the Wonderscope platform and the Storymaker tool. Within is the premier destination for innovative, entertaining, and informative story-based virtual and augmented reality. We bring together the best immersive experiences from the world's finest creators—from gripping tales set in worlds of pure imagination to documentaries taking you further inside the news than ever before. Founded in 2014 with the goal of defining the new medium of spatial storytelling, Within creates, acquires, and distributes premium AR & VR experiences across web, mobile, console and headsets. With their deep expertise in multi-media narrative, Within creates tools, formats and proprietary software to differentiate its original content and enable future immersive media creators. Investors include Andreessen Horowitz, Temasek, Emerson Collective, 21st Century Fox, WPP, Raine Ventures, WME, Live Nation, Vice Media, Tribeca Enterprises, Annapurna Pictures, and Legendary Pictures. For additional news and information follow @WonderscopeApp on Facebook and Twitter. *Wonderscope is compatible with the following devices running on iOS 11 or newer: iPhone 6S or newer, 2017 iPad or newer and iPad Pro.